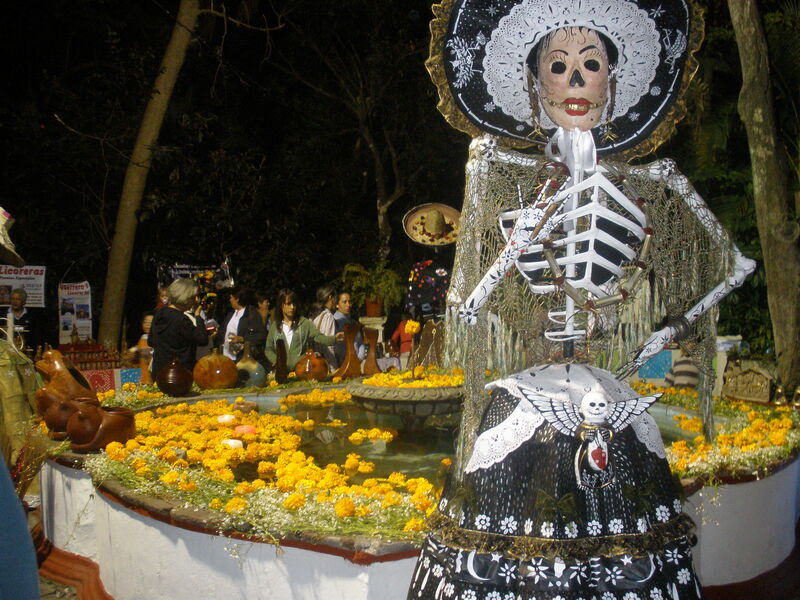 To celebrate Dia de Muertos, or Day of the Dead, an exhibit was held at the Jardin Borda in Cuernavaca. On display were nearly thirty life size skeletons, or calaberas, intricately decorated using all sorts of materials including chiles, beans, flowers, candies and even eggshells. The exhibit opened on Thursday and an opening day reception was held that evening. The opening was free to the public and featured extravagant displays, live music, and traditional food and drinks. Today we returned to Mexico City where we’ll spend the next week before departing for Oaxaca to begin our long trip. Mexico City, as it turns out, is also a great place to be during Dia de Muertos. The main days of celebration are the first two days in November with tomorrow being the most important of the two. I can hardly wait to see some of the displays and events taking place around the city and to learn more about the traditions and history of the celebration. After spending the past two weeks in Cuernavaca it’s easy to see why so many people choose to study Spanish here. 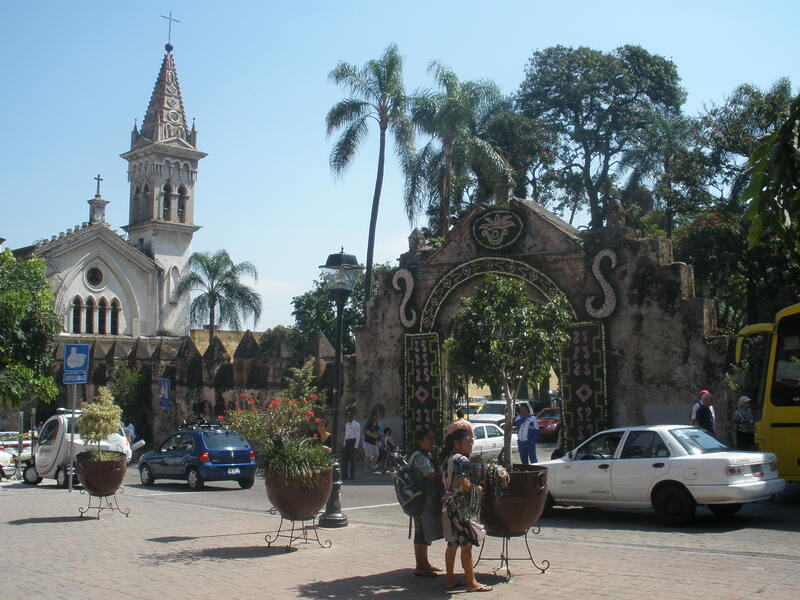 In fact, Cuernavaca is one of the most popular places in all of Mexico for foreigners to take Spanish lessons. I’ve spent the past two weeks studying at Centro de Idiomas y Culturas. In addition to lessons in the classroom, my teacher Fabiola took me out into the city to see some of the popular attractions including a photography museum housed in a miniature castle, the Catedral and the Jardin Borda. We visited the local market just days before Dia de los Muertos to see the traditional breads, flowers, candles and chocolates and explored the underground waterways of the Pasillo de la Barranca. Overall, I’ve found Cuernavaca to be welcoming and very accomodating to visitors, especially those who do not speak Spanish very well. In addition to beautiful weather year round and numerous attractions, there are also countless opportunities to practice speaking with local people who are accustomed to interacting with language students and patiently take the time to correct vocabulary and make friendly conversation. I experienced this first hand during my interactions with the juice vendor on the avenue. Each morning I would point to the cup of freshly squeezed grapefruit juice I hoped to purchase and offer a polite “por favor.” He would smile and clearly pronounce “toronja” before handing over the cup. He seemed pleased a few days later when I finally got it right, pronunciation and all. It’s unlikely I will forget the word for grapefruit anytime soon, and learning this way sure beats trying to memorize words out of a dictionary! Tepoztlan is an interesting, lively and fun little town located 80km south of Mexico City. We traveled by bus from Cuernavaca and it took about thirty minutes. It’s a blend of well-preserved indigenous cultures and New Age beliefs and spirituality. The town is believed to be a magical place and claims to have a sort of creative energy. For this reason Tepoztlan attracts its fair share of writers and artists. Astrologers frequently travel here to investigate reports of UFO sightings. In addition, the town is believed to be inhabited by witches, but of the good variety. Alternative medicine shops, psychics and aura cleansers can be found around every corner, many owned and operated by expats from abroad, and the town itself has come to be known as somewhat of an international post-hippie mecca. One of Tepoztlan’s main attractions is its local market. We visited on Sunday which is one of the busiest and most animated market days. 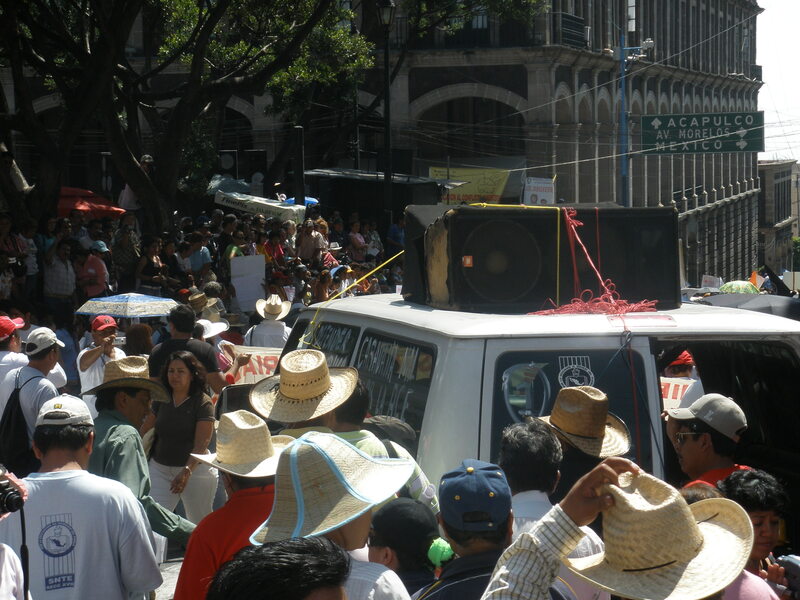 Vendors lined the streets throughout the center of town and inside the Zocalo. There were separate areas for fruits and vegetables, prepared foods, clothing, accessories and crafts. Scattered among them were stands selling ice cream, water ice and drinks called Micheladas. A very popular beverage and one that the town is known for, a Michelada is a mixture of two kinds of hot sauce, lime juice, and Corona. People were already drinking them from giant styrofoam cups when we arrived around 11 a.m. Finally, we opted to try the smaller version, and as I suspected it was pretty gross, but I think I might have been the only one to think so since people were lined up all over the place to buy them and Carlos finished the whole cup. Recently, it seems there is a pyramid or archaeological site to tour nearly everywhere we visit and Tepoztlan was no exception. 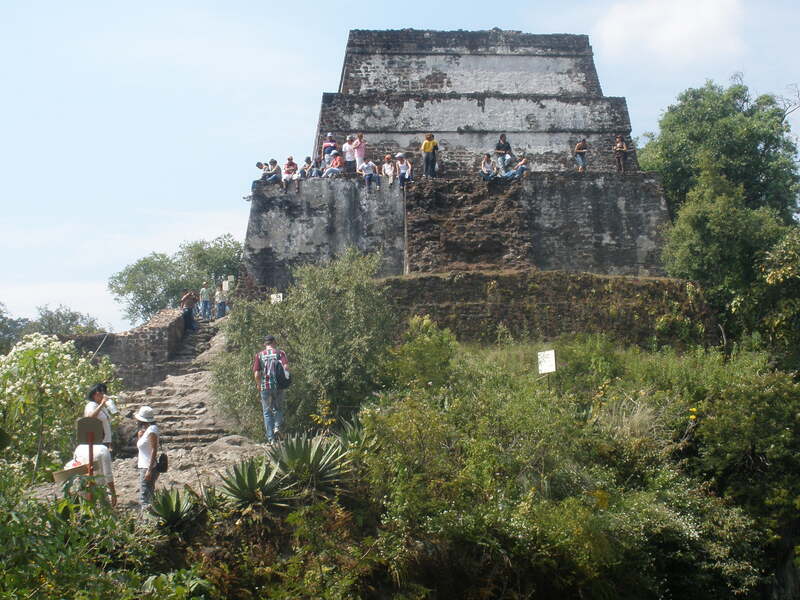 The cliff-top Piramide de Tepozteco is located approximately 2.5km from the city center. Of that distance, 2km is made up of rugid, steep stone staircases that snake up the side of the cliff. From the city center the pyramid is visble as nothing more than a white speck on the top of the mountain side. So small in fact, I could barely get it to appear in any of my photographs. At first it seemed hard to believe that it was possible to hike to the top, but after climbing countless steps and nearing complete exhaustion we finally made it. While not nearly as large as some of the other sites we have visited, the fact that it remains so isolated and difficult to reach made it all the more impressive. And even more impressive was the fact that people were working at the top selling tickets and beverages. Imagine having that as your daily commute! 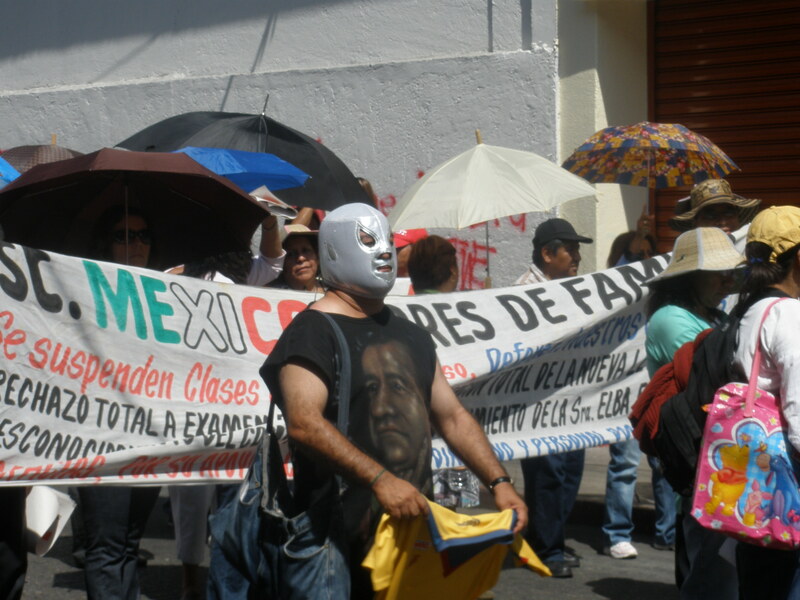 It seems that nearly every day there is a protest, march or rally somewhere in Mexico. Most recently, the teachers in the state of Morelos are on strike. The strike and accompanying protests have been going on for several weeks now, since before Carlos and I arrived in Cuernavaca. Many of the teachers have set up camp in the Zocalo and their banners and tents have nearly taken over the center of town. This afternoon while having lunch in one of the many downtown sandwich shops, we suddenly found ourselves in the middle of several marches converging on the center square. A few firecrackers were set off to announce the beginning of the event and within minutes the various streets leading into the Zocalo were crowded with marchers carrying banners and signs. Teachers and students from all across the state of Morelos as well as surrounding states had traveled to Cuernavaca to participate. We took our place alongside the many other onlookers snapping pictures and listening to the chants blaring from the speakers that were strapped to the tops of cars and trucks. I still don’t understand enough Spanish to fully grasp what it is they are protesting, but for the most part it seems people here are strongly opposed to the privatization of their schools and generally dislike the current administration of president Felipe Calderon. After the march ended everyone gathered in the Zocalo to listen to speeches and to eat the free food that was handed out to the crowds by various participating groups and organizations. There was music and festivities following the rally and fortunately for us, the streets remained closed for a couple hours after the marches came to an end providing the perfect opportunity to do some more sightseeing. The archaeological zone of Xochicalco is a Unesco Heritage Site and one of central Mexico’s most important archaeological sites. 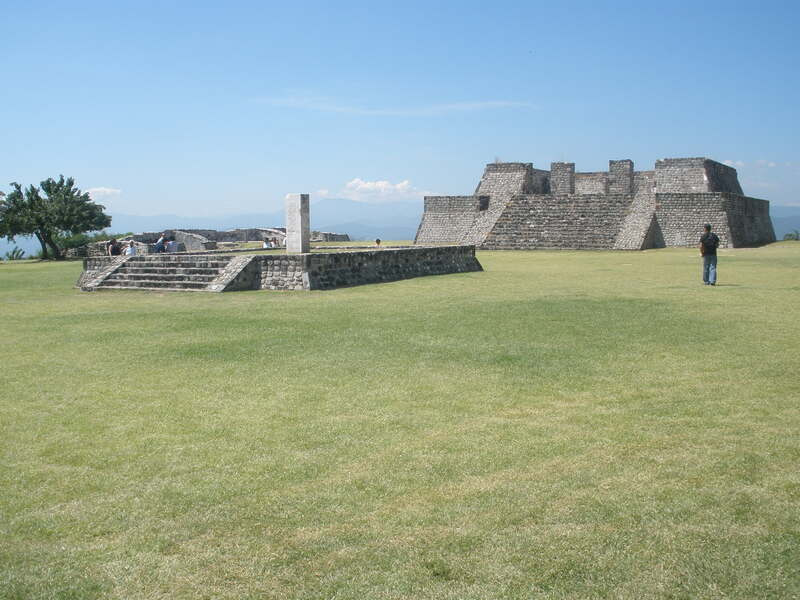 This ancient ceremonial center is now a collection of white stone ruins, the most notable being the Piramide de Quetzalcoatl, or Pyramid of the Plumed Serpent. Located 15km southwest of Cuernavaca, the site is said to have been a commercial, cultural and religious center representing the various ancient cultures of central Mexico and gained importance around the time Teotihuacan began to weaken. 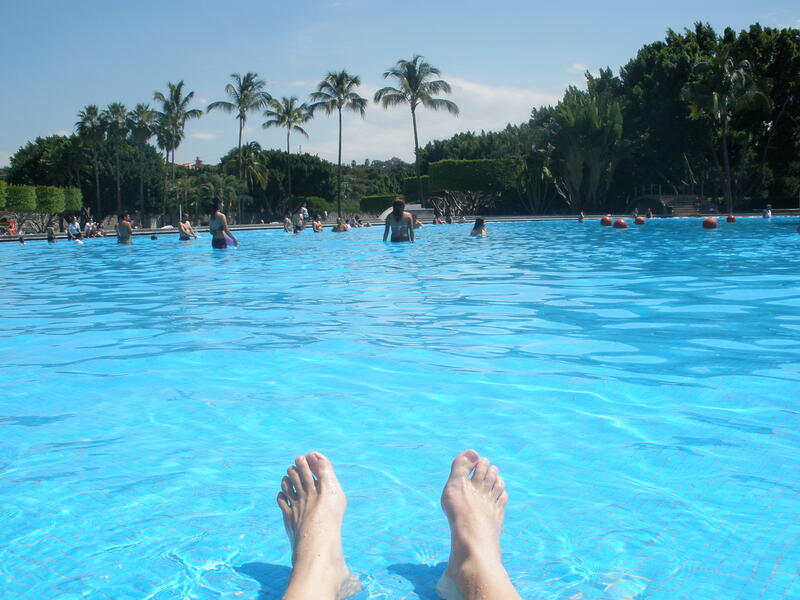 Since we haven’t made it to the beach yet we figured we’d do the next best thing and visit one of the several balnearios, or water parks, surrounding the city of Cuernavaca. Also known as the City of Eternal Spring, the temperature here remains between 70 and 80 degrees Fahrenheit year round. Perfect for spending the day swimming in one of the wave pools, riding water slides or relaxing under a palm tree. 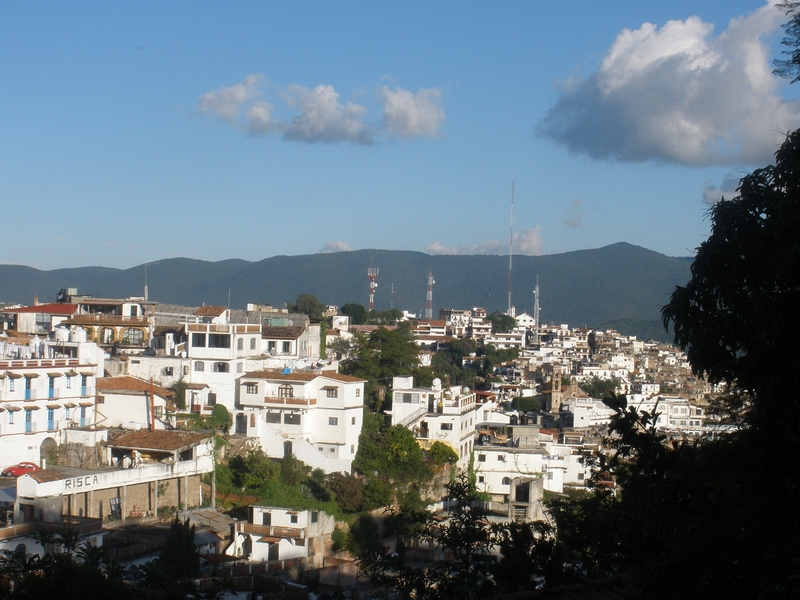 The town of Taxco is best known for its intricate handmade silver jewelry and its popularity with tourists. Once a silver mining town, today Taxco is a well preserved, colonial town that the Mexican government has declared a national historic monument. Buildings are well worn and painted white with black signage and trim. All new architecture must conform to the original style and old buildings are restored whenever possible. Taxco is a great place to explore with its narrow cobblestone streets and steep stone staircases that snake up the hillside and twist and turn throughout the center of town. It’s easy to get lost here, and the hikes up and down the hillside can be exhausting. Fortunately, most streets eventually converge on the central marketplace and amazing views of the hillside can be seen around every turn. And if you get tired of walking you can hire one of the many white Volkswagen bugs seen speeding around town to taxi you to your destination.